The give them out all day, from 9am. So I need to get somebody to get mine! P.S. The wristbands only insure the ability to purchase the DVD, correct? Can people attend the party without a wristband? Alison wrote: P.S. The wristbands only insure the ability to purchase the DVD, correct? Can people attend the party without a wristband? I'm not sure but I'm thinking no? Fire codes only allow a certain number of people in a space at a given time. Unless I'm just over-estimating and thinking these parties are going to be bigger then they actually will be....I'm pretty certain that the NYC store (where I'm going) will be utter chaos though. I just called my Borders because I'm paranoid. The party I am attending is at a Borders Express, so they're not even doing wristbands. The store is in a mall, so it's pretty tiny. The girl I spoke to told me they barely promoted it, so they're not even really expecting a turnout. I hope it's still fun... I was kind of hoping for the chaos, as long as I got the DVD in my hands. I'm worried that the party I'm planning on going to will be chaos too, lol. "Oh, well I think we can handle that"
TeamEdward1918 wrote: I'm worried that the party I'm planning on going to will be chaos too, lol. "Oh, well I think we can handle that"
haha love that! I moved last month and am still unfamiliar with the neighborhood and I saw a Jasper Street today and got all excited. I tried to not sqeal so I wouldn't get an odd look from my husband. So, I haven't pre-ordered my dvd yet and I was hoping for some advice. Borders has a special edition dvd that comes in a cool cover with a booklet and exclusive photocards. I am not sure what comes in the booklet. Target has a 3-disc deluse edition that includes a bonus disc with 45 min of "additional never-before-seen content". Does anyone know of other deals? I want to get the dvd with the most so any suggestions would be very helpful. Amy wrote: So, I haven't pre-ordered my dvd yet and I was hoping for some advice. Borders has a special edition dvd that comes in a cool cover with a booklet and exclusive photocards. I am not sure what comes in the booklet. Target has a 3-disc deluse edition that includes a bonus disc with 45 min of "additional never-before-seen content". Does anyone know of other deals? I want to get the dvd with the most so any suggestions would be very helpful. I know that Target has a 2-disc(I think) with a free i-tunes download, and then Best Buy has one that's Blu-ray. I think that Twilighters did a video with all editions, pros and cons. 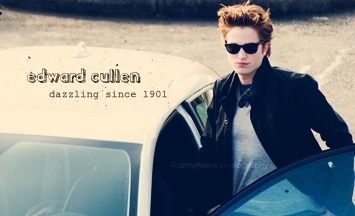 Last edited by TeamEdward1918 on Thu Mar 19, 2009 10:29 pm, edited 3 times in total.